Not only is Sabudana gluten free but also a very healthy vegetarian option for dishes. One ingredient that should be on all menu’s this Ramadan. This recipe has grilled prawns flavored with Knorr Chicken Stock Powder as it contains real savory flavours complementing the sweet prawns. In a fine-meshed strainer, rinse the sabudana under cold running water. Heat the olive oil in a large pot over a medium heat. Add the onion, garlic and cook, stirring occasionally, for 3 minutes or until the onion softens slightly. Add the soaked Sabudana and sauté for 1 minute, then add the broth made from Fish sauce and Knorr Chicken Stock Powder combined with 2 L water. Bring to a boil uncovered. When it starts to boil, reduce the heat to the lowest setting, cover, and simmer for 20 minutes, or until the water is absorbed, and the sabudana is cooked and tender. Remove from heat, add the parsley, capsicums and black pepper. Heat butter in a large skillet over medium high heat. 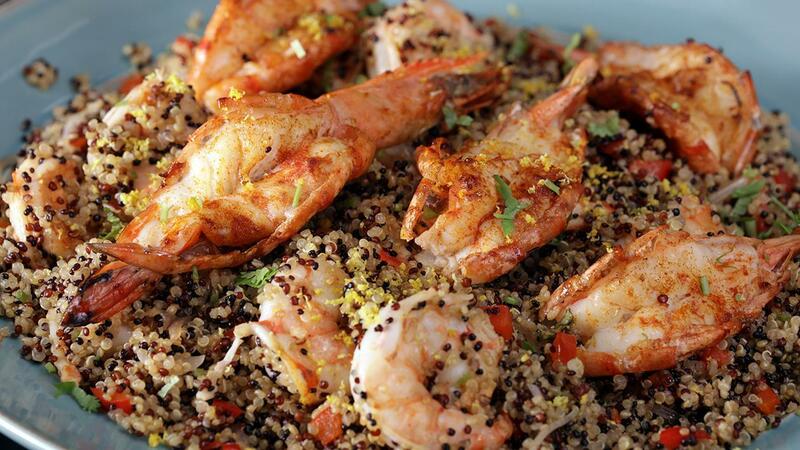 When the pan is hot, add the shrimp and sprinkle with Knorr Coating Mix marinade. Sauté until no longer translucent but juicy and pink. Season with smoked paprika for a spicy twist. Mix the sabudana and shrimp together, drizzle with lemon juice, and sprinkle with fresh chopped parsley. Serve the spicy garlic shrimp and sabudana immediately, while still hot.